My neighborhood is full of kids who love to play outdoors. 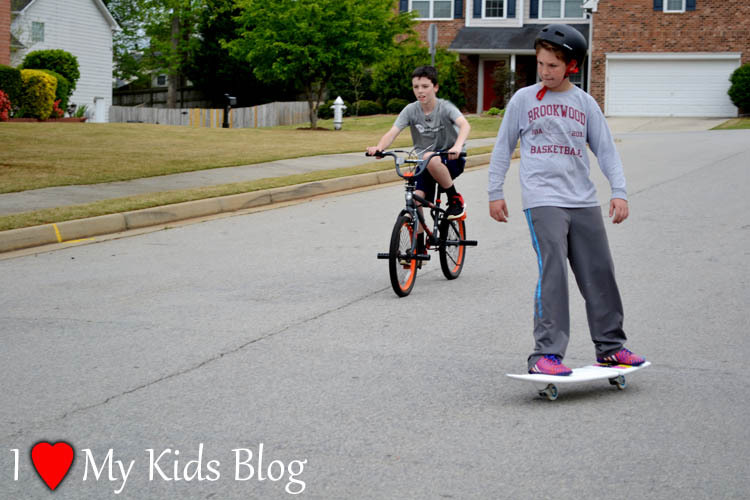 Almost every day you can step outside to see bicycle and Razor RipStik races zooming past my house. The energy is always high and filled with excitement. My children love to go out and cheer on the neighborhood kids as they race from the top of the street down to the bottom in the latest competition. One day as these races were happening, I decided to bring a new twist to the game, the RipSurf by Razor. Razor is always looking to add new and exciting items to their line-up of outdoors toys, and the new RipSurf is making huge waves. It takes the patented RipStik Air Technology and fuses it onto a surfboard design, allowing riders to move the RipSurf without ever stepping off the board. Razor has provided me with a RipSurf so I could form an opinion and share it with you. Regardless of this arrangement, I am not required to give a positive review. All opinions expressed are my own honest thoughts and experiences. 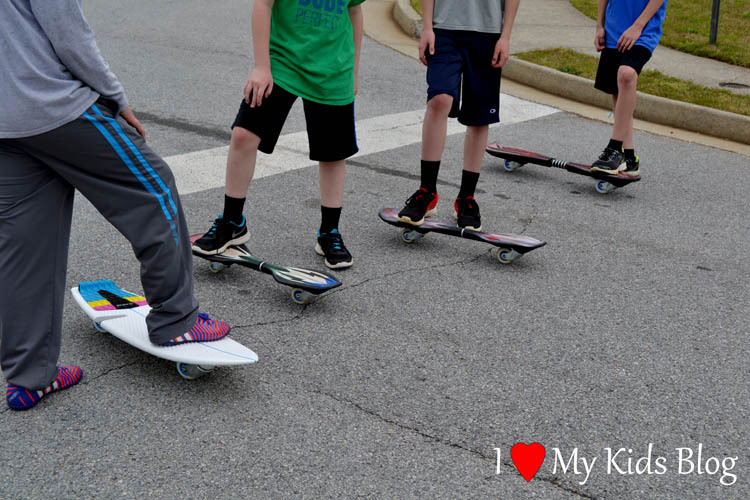 The RipSurf is recommended for children 8 years and older, so I relied on the older kids in my neighborhood to take it for a spin and really give me some great feedback. After getting permission from their parents, the neighborhood boys lined up at the top of the hill waiting for their turn to ride this wave of excitement. The movements of the RipSurf are very smooth and those who had experience with the RipStik had no problem getting started on the first or second try. The movements looked flawless and the boys couldn’t get enough of it. Transitioning from the road to the sidewalk was a breeze and had our grass not been saturated, there would have been times when the RipSurf could have crossed small portions of the grass without interfering with the riding. However, due to the fact that the ground was wet, everyone who tried failed, and the wheels sunk fast into the soil. Having never set foot on a RipSurf before, I asked the neighborhood boys what pros and cons they felt existed with the RipSurf. Overall, there were more pros than cons. Everyone seemed to agree that the RipSurf definitely moved faster than the RipStik and had a more smooth ride to it. They loved how they could drift easily across the road and how they actually felt like they were surfing. The board was perfect for balancing but was more difficult to maneuver than the RipStik because it didn’t have a twisting agent in the middle of the board. Everyone felt that the grips on the board were great and they could easily determine foot placement as soon as they started to ride. It is not necessary to have had experience with other products from Razor to learn to ride the RipSurf, but it is helpful. 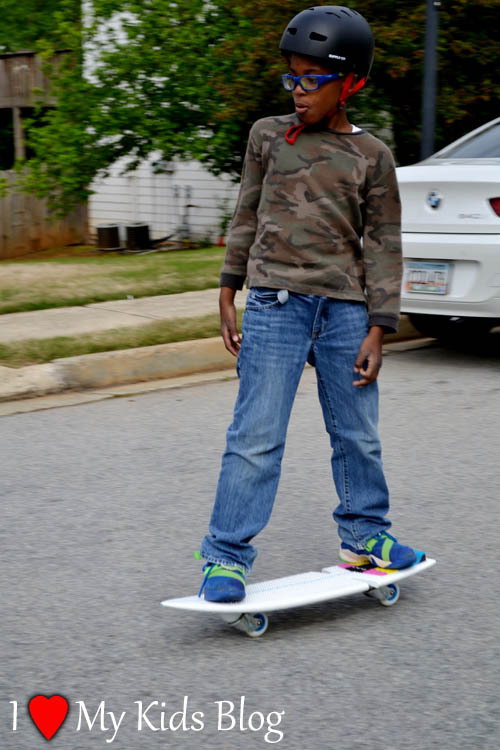 One neighborhood boy had never been able to get the RipStik down, but after a few tries on the RipSurf, he could cruise down the street without any problems. 1. Always make sure you have on your safety gear. Helmets are always a great suggestion, along with knee and shoulder pads as well. 2. Try to find your foot placement first by using a railing to stabalize yourself. 3. While holding onto a railing or stable surface, slowly move forward, releasing your hands over time for balance. 4. Don’t overthink it. You will fall, and it will be okay. 5. Practice makes perfect, so don’t give up. The RipSurf is definitely a fun and exciting new outdoor toy for those looking for a new challenge or adventure. It has a trendy design and is currently the talk of my neighborhood and can be purchased at Toys R Us. Enjoy the video I have put together. Show your children and friends and tell me what their thoughts are on the Razor RipSurf!